The Samsung Galaxy Tab A 8.0 is the smaller of the newly launched Samsung Galaxy Tab A family of tablet devices. 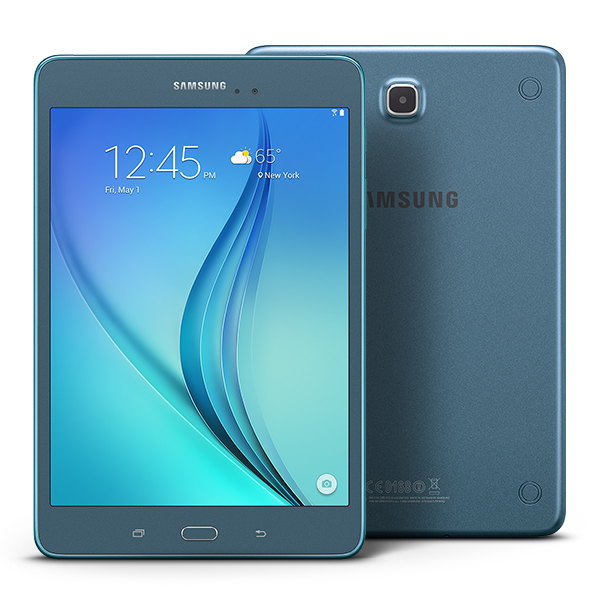 The Samsung Galaxy Tab A 8.0 features a 8.0-inch touchscreen display and is priced at $230. Unlike the Samsung Galaxy Tab A 9.7, the Samsung Galaxy Tab A 8.0 is available only without the S Pen in USA. 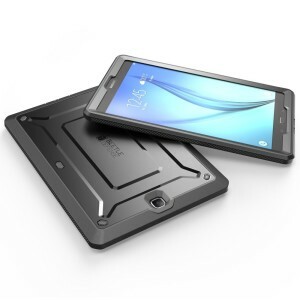 Listed below are the top 10 best Samsung Galaxy Tab A 8.0 cases and covers. 1. ProCase Samsung Galaxy Tab A 8.0 Folio Case Cover: The ProCase Samsung Galaxy Tab A 8.0 Folio Case Cover is the best looking Galaxy Tab A 8.0 case. 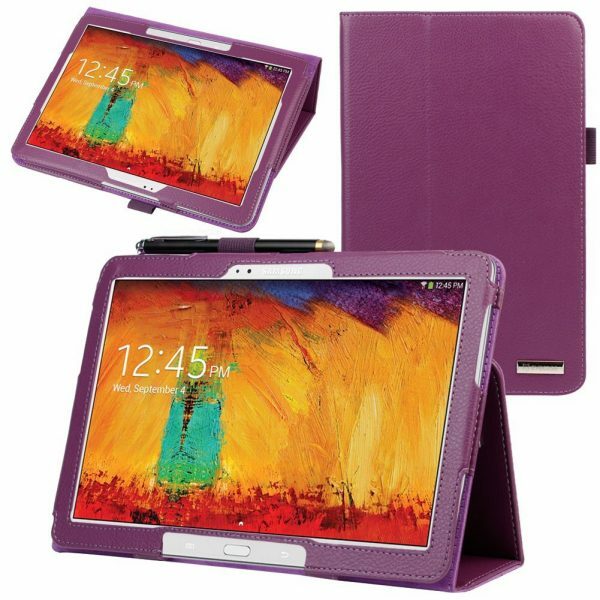 The ProCase Samsung Galaxy Tab A 8.0 Folio Case Cover is made from premium leather, supports multiple horizontal viewing angles and has a built-in stylus holder. 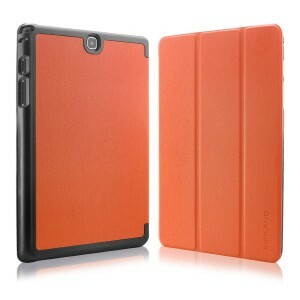 The ProCase Samsung Galaxy Tab A 8.0 Folio Case Cover is available in 3 colors. 2. Supcase Unicorn Beetle Pro Series Full-body Hybrid Protective Case for Samsung Galaxy Tab A 8.0: If you are serious about providing protection to your Samsung Galaxy Tab A 8.0 from drops, bumps or scratches, the Supcase Unicorn Beetle Pro Series Full-body Hybrid Protective Case is an ideal choice. The Supcase Unicorn Beetle Pro Series Full-body Hybrid Protective Case for Samsung Galaxy Tab A 8.0 has impact resistant bumpers for shock absorption and a built-in screen protector to protect the display from scratches. The Supcase Unicorn Beetle Pro Series Full-body Hybrid Protective Case for Samsung Galaxy Tab A 8.0 is available in 2 colors: black and white. 3. 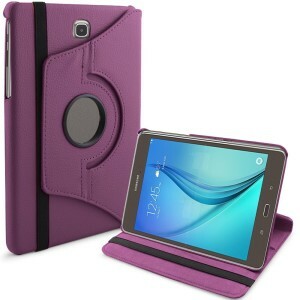 LK Samsung Galaxy Tab A 8.0 Leather Case Cover: The LK Samsung Galaxy Tab A 8.0 Leather Case Cover offers 360-degree rotation letting you choose between landscape and portrait orientation. 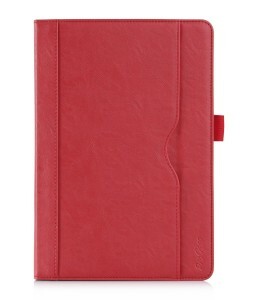 The LK Samsung Galaxy Tab A 8.0 Leather Case Cover is available in 4 different colors. 4. 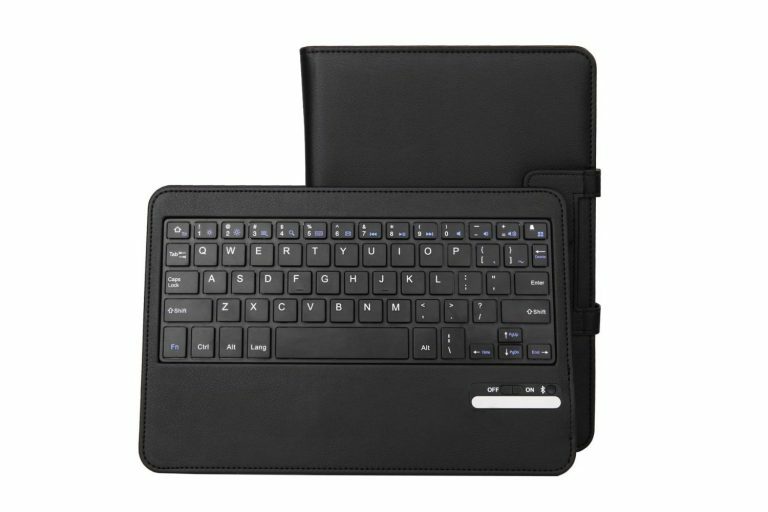 IVSO Samsung Galaxy Tab A 8.0 Bluetooth Keyboard Case: The IVSO Samsung Galaxy Tab A 8.0 Bluetooth Keyboard Case provides protection to your tablet device as well as a detachable physical keyboard. 5. Fintie Samsung Galaxy Tab A 8.0 Smart Book Cover Case: The Fintie Samsung Galaxy Tab A 8.0 Smart Book Cover Case is custom made for the Galaxy Tab A 8.0 and offers three viewing positions. 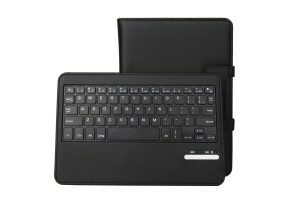 The magnetic closure secures the device and also supports smart auto sleep/wake feature. 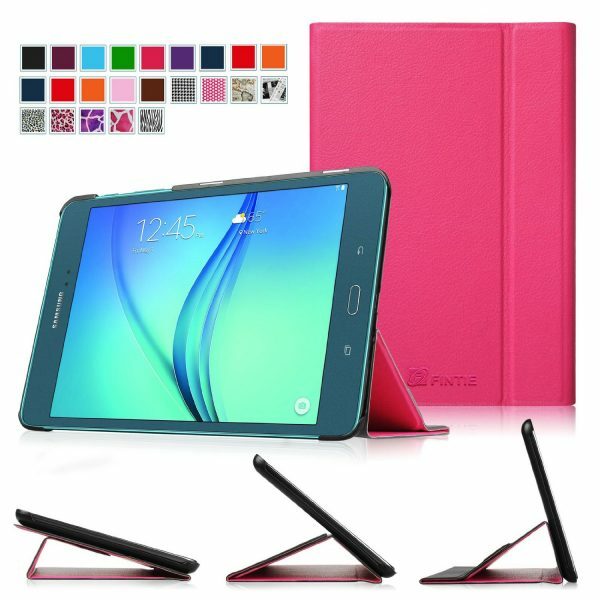 The Fintie Samsung Galaxy Tab A 8.0 Smart Book Cover Case is available in 6 colors. 6. Fintie Samsung Galaxy Tab A 8.0 Kiddie Case: If you need a secure and easy to carry around Samsung Galaxy Tab A 8.0 case for your kids, the Fintie Samsung Galaxy Tab A 8.0 Kiddie Case perfectly suits your needs. The Fintie Samsung Galaxy Tab A 8.0 Kiddie Case is available in 6 different colors. 7. 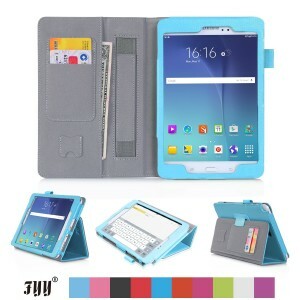 MoKo Slim-Fit Multi-angle Folio Cover Case for Samsung Galaxy Tab A 8.0: The MoKo Slim-Fit Multi-angle Folio Cover Case for Samsung Galaxy Tab A 8.0 functions as a built-in stand with multiple viewing angles and the interior hand strap lets you conveniently hold the Galaxy Tab A 8.0. 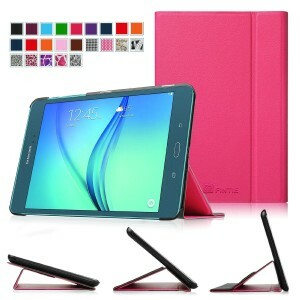 The MoKo Slim-Fit Multi-angle Folio Cover Case for Samsung Galaxy Tab A 8.0 is available in a large number of colors. 8. 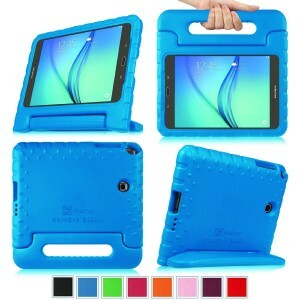 Infiland Samsung Galaxy Tab A 8.0 Smart Shell Case: The Infiland Samsung Galaxy Tab A 8.0 Smart Shell Case supports two viewing angles and auto wake/sleep function. 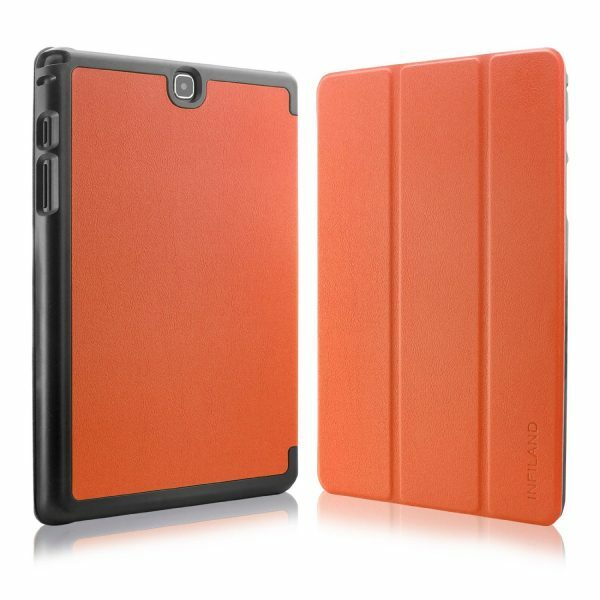 The Infiland Samsung Galaxy Tab A 8.0 Smart Shell Case is available in 10 colors. 9. Evecase Samsung Galaxy Tab A 8.0 SlimBook Leather Folio Stand Case Cover: The Evecase Samsung Galaxy Tab A 8.0 SlimBook Leather Folio Stand Case Cover is made from premium synthetic leather and has a soft microfiber inner lining. The case is also compatible with the S Pen. 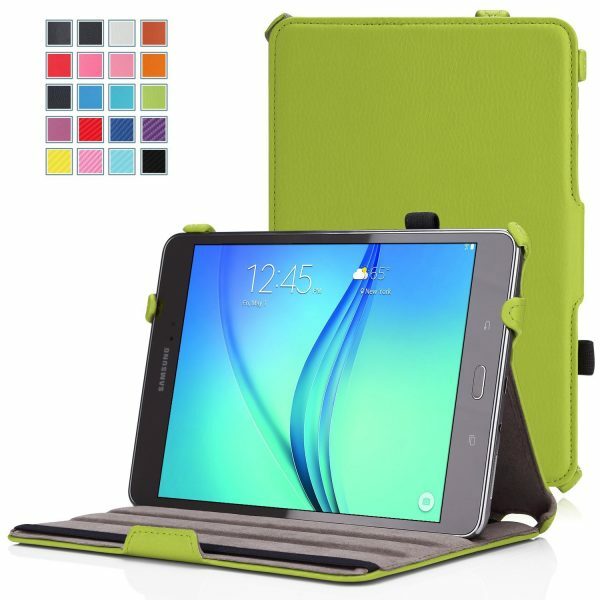 The Evecase Samsung Galaxy Tab A 8.0 SlimBook Leather Folio Stand Case Cover is available in 3 colors. 10. FYY Ultra Slim Magnetic Smart Cover Case for Samsung Galaxy Tab A 8.0: The FYY Ultra Slim Magnetic Smart Cover Case for Samsung Galaxy Tab A 8.0 is an inexpensive case that has card slots, cash pockets, stylus holder and a hand strap. The FYY Ultra Slim Magnetic Smart Cover Case for Samsung Galaxy Tab A 8.0 is available in 4 different colors. These are the top 10 best Samsung Galaxy Tab A 8.0 cases and covers.